^Thanks! I'm going to scratch that idea then and see if I can get some much smaller ones made for the L&R sides that curve to the outer sides of the wheel wells. Splitter 2.0 with diffusers is my spring project. I'm intending to run the newer PA curved diffusers to the wheel wells, and I'm considering adding straight diffusers to the side areas that extend beyond the sides of the bumper, to kind of function like small wings. I may experiment with additional diffusers into the engine bay, behind the radiator (hood is already vented). My current splitter already extends to mid-way along the oil pan but I may need a stronger rear support design than I currently use if I add a diffuser back there (rear is held in place with rubber wellnuts in the subframe). I'm also considering the best way to tackle a flat floor. The exhaust is the challenge, since it hangs below everything else. The flat floor either has to be spaced down below the frame, or has to have cutouts for the exhaust. I plan to use wellnuts into the existing frame rail holes to mount whichever design I come up with. i've been thinking about this for awhile for my other car, and I can't seem to find a good/practical solution for this. easy. cut a slit in the flat bottom at the jacking points. thats what im gonna do. Yeah, I intend to leave gaps at the side jack points, or I may alternately reinforce the floor at the jack points and mark the locations under the floor. My splitter extends beyond the front jack point, but I simply heavily reinforced the splitter at that location so that I can jack the car up from the front jack point with the splitter sandwiched between the jack and jack-point. That way I can easily get the front of the car up without removing the splitter. I do have to have the front tires on ramps to reach the point, of course, even with a low-profile jack. I wonder if there is an advantage to front downforce to allowing extra air under the middle of the splitter, or if that only benefits the rear diffuser at the back of the car by feeding it additional air? ^ It actually creates more front downforce. The simple goal of the splitter diffuser is to increase the velocity and mass of the airflow underneath the splitter. The more air flowing at faster speeds means an increased low pressure zone beneath the vehicle. The lower the pressure you can get beneath the splitter, the more downforce to be had. The only reason they aren't full width is that there is an engine, radiator, suspension, and steering in the way. Purpose built cars move the steering and suspension high and move the radiators to the side. 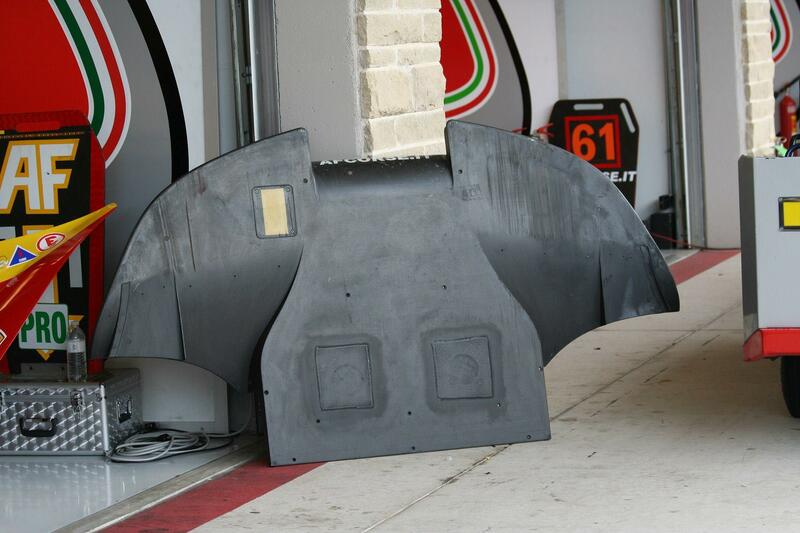 LM Prototypes and some unlimited time attack cars end up with a front wing outright.